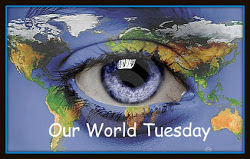 Today is Tuesday, so that means it's time once again for Our World Tuesday, a meme that encourages bloggers to share images of their world. It's a great way to get a glimpse of life through the eyes of others! You can find out more about it here. Even if you don't participate, I encourage you to take a look at the intriguing photos that bloggers from around the world share each week. 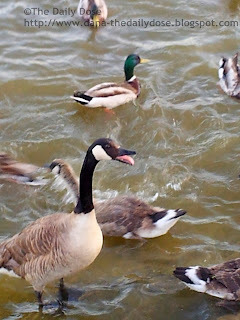 My husband took these photos while I tossed Cheerios into the lake—and this brainy goose actually caught some of them! Wow. Those goslings are already very big. I saw some the other day that were only half that size. How fun to see cranes walking by! A couple weeks ago we were putzing around the lake and a family of geese waddled off the shore and into the water. It was sweet watching mom and dad keep those babies together. However, if you've ever had to deal with goose droppings on your sidewalk, you wouldn't find them quite so cute. Where my husband works, they had to hire a company to come in with a special spray to keep the geese away because the sidewalks were so heavily littered that customers could barely find a place to put their feet to get into the building! Well, that was pleasant, wasn't it? Awww, I love visiting the ducks! I just recently did just that and snapped some photos too. I'll have to put one of those up for a wordless wednesday! Who knew they liked Cheerios? Fun shots. Great shots of the Canadian Geese and Mallards. They sure are! There were a ton of people there feeding them that day. Thanks, Adriana. Happy Tuesday to you, too! We used to feed ducks...there were white geese but they were mean and they bit. Your goose looks much friendlier...and hungrier. All these birds love to be fed. Thank you for your visit. I see you answer people here on your blog but I am afraid I don't have the time to come back and read them. Sorry. Thanks. I hope you have a great week, too! Ya they are big!! Boom & Gary of the Vermilon River, Canada. We have a lake in our back yard, but typically it's filled with pelicans and other tropical birds. So fun to watch them--but the big ones, they're so loud first thing in the morning. I've never seen a pelican in person. Sounds like fun! Looks like a scene from where I live in Chicago. I live across from the North pond which parallels lake Michigan. So All I see are geese and ducks. They are EVERYWHERE.. but I do like them most of the time. LOL. LOL Yep, I understand that! Ha! cheerios and Canada Geese! lovely shots! I think I see a cheerio in its mouth! I wouldn't be surprised. He was really going after them! I guess Canadian geese eat anything! What a lovely sight. I occasionally see ducks and geese in my area. I once stayed in a house by a lake and loved seeing them every day. That sounds like a wonderful retreat. Happy Tuesday! Geese are so much fun to watch and photography! They sure are! They have so much personality. Cute! That geese looks like it loves posing for the camera. So adorable. ....eine hat wohl immer den Schnabel offen! I think he probably does have his beak open all the time. Thanks, Luis! Great shots of the geese! They must look forward to people feeding them. Have a great day! I love going to the duck pond here and the ducks like it too... but the geese? They literally chase me around until I leave, as soon as they spot me. 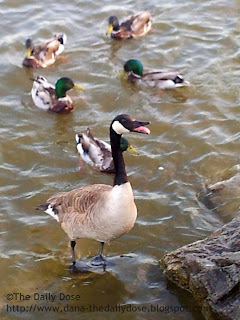 Geese can be kind of ornery, can't they? Feeding the geese with Cheerios. What a great idea. We have geese and goslings around our area right now too. This is the type of goose (plus millions of his close personal friends) that leaves us little presents on the sidewalk. If they were once Cheerios, they aren't any longer. 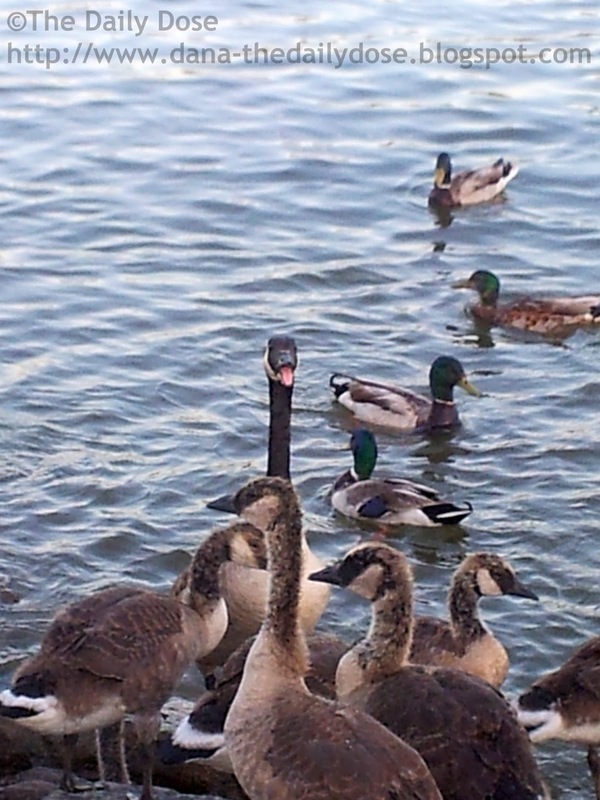 I like these geese, that big one acts more like a dog! You're right: it really did! Beautiful ... That duck is giving a speech! I'm glad. I hope you're having a nice Wednesday. Loved the pictures, Dana. I have my own goose story, which I'll post today. Great pictures! I wish there was some place around here to feed the ducks. It was one of my favorite things to do as a kid. Oh man, I love that goose! Smart thing, figured out how to get the Cheerios first. He's pretty clever, that's for sure! Going to feed the ducks (and geese) was one of my favorite things as a kid. Nice photos! 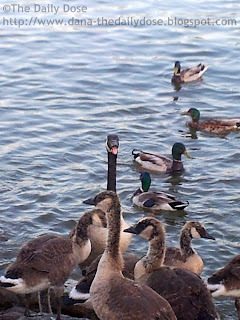 I love ducks, and that goose looks like a cut-up! Thanks for sharing these, Dana! He really was! He was great fun to watch. Its amazing what a goose will do for some breakfast cereal! LOL Sure is! Thanks, Stewart. Happy Tuesday on Thursday .